I just wanted to inform you that I will be taking some time off to finish the study that I’ve currently been working on. The study I’m writing along with Pastor Dan Krebs will be deeper than any of the studies I’ve hosted here. In fact, we’re preparing a book as well as study guides and videos. The Beauty of Jesus Revealed in the Feasts is packed with Biblical insight as well Jewish history and traditions. It’s the most incredible Bible study I’ve worked on, but I need time to finish writing it. In the meantime, my friend, Davonne Parks will be hosting a series here on the blog called “8 Weeks of Intention: Embracing Your Role at Home.” Davonne believes that your role at home is valuable and she wants to help you thrive in your environment. The series will run from September 4th – October 27th. You’ll find an introductory post here on the blog one week from today, which will provide you with more information. Note: If you are looking for any posts you have missed, or a FREE copy of the study guide, you can find the table of contents by clicking here. Below are my thoughts for each of the chapters we studied this week along with the answers to the questions I posted in the study guide. 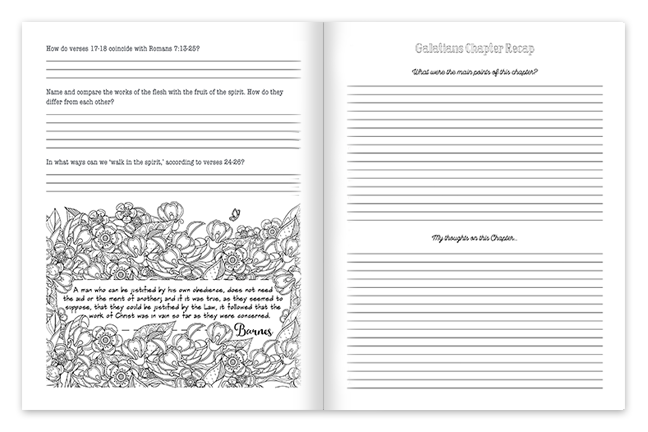 Also, make sure that you get a copy of the coloring page I have pasted below. Have a great weekend! Since Christ has made a free from the law we aren’t bound by the rules and the many stipulations of the law. There’s a freedom there to observe these ceremonies if we want to (such as circumcision, and keeping the Sabbath holy) as long as we’re not depending on them for salvation. What makes following and/or practicing the law ‘unprofitable’? Because the law doesn’t save us. If we put our faith in the law for salvation, we are missing the entire point of the law which was to point the way to salvation and teach men the severity of sin and the importance of redemption. 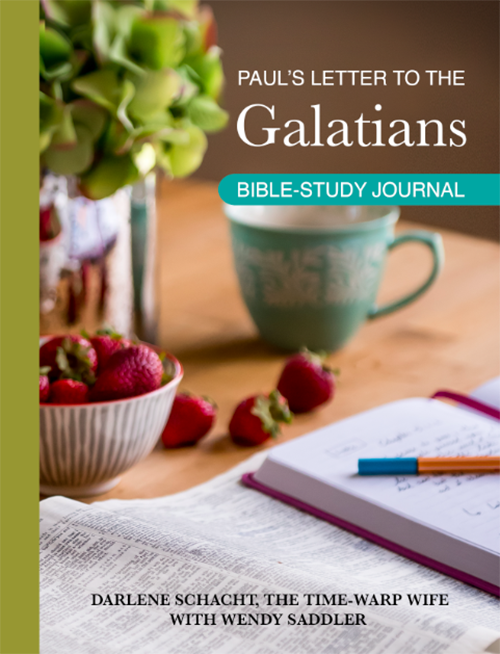 Why does Paul express such shock and disappointment over the Galatian believers having fallen for this false doctrine? These were Paul’s converts, and so they were like children to him, born of the gospel of truth. All of the work he had invested in them was being undone by those who were preaching a false doctrine of faith by works. In what way have we been called to liberty? Faith in Jesus Christ has made us free. We are free from the law, because we choose to serve Him. And so we don’t use our liberty as an opportunity to sin, but rather to serve the One who saves. Explain the reference Paul uses to leaven in verse nine. How does it apply in this situation? Leaven in scripture always refers to influence, whether bad or good. And so the Kingdom of Heaven is symbolic with heaven in one scripture while the leaven of the Scribes and Pharisees is described in yet another. When a little influence is added to one’s life it begins to ferment and grow until it affects the entire lump of dough. At the beginning of every Passover season, leaven was removed from the home completely in preparation for the feast of unleavened bread. Every single nick and cranny in the home was searched for leaven, removed from the home, and either sold or burned. Their homes remained leaven-free for a period of 7 days. This tradition was symbolic of searching for and removing the influence of sin from our lives. And so the people at that time were familiar with the term and what it meant to their salvation. What Paul is saying here is that this person or people who are influencing you are planting ideas in your mind that need to be removed. How can we live the liberty we are called to, according to verse 13? By investing our lives in Jesus Christ. We work to serve Him because we love Him, not because our work justifies our sin or leads to salvation. When we realize the gravity of sin and the gift of salvation, our lives are changed. And yes, we walk in liberty, knowing that we are saved by grace. That knowledge leads to a life of obedience in the One that we serve. How do verses 17-18 coincide with Romans 7:13-25? And so we see in Romans 7 that Paul describes that internal struggle.As long as we’re still in this world, we struggle with the temptation of sin and the weakness of our flesh. It’s for this reason that we must crucify the flesh at the moment we accept Christ and every time it wars against our Spirit, which is a day-after-day crucifixion. Name and compare the works of the flesh with the fruit of the spirit. How do they differ from each other? The fruit of the spirit is: love, joy, peace, longsuffering, gentleness, goodness, faith, meekness, and temperance. The works of the flesh are: sexual immorality, impurity and debauchery; idolatry and witchcraft; hatred, discord, jealousy, fits of rage, selfish ambition, dissensions (discord), factions (division) and envy; drunkenness, orgies, and the like. The fruit of the spirit doesn’t always always come naturally. I needs to be exercised in our lives. We need to discipline ourselves rather than yield to the sin that tempts us. The works of the flesh are the many temptations we yield our bodies to. These are choices we make each and every day as choose to either follow the Spirit or follow the flesh. In what ways can we ‘walk in the spirit,’ according to verses 24-26? By crucifying our flesh on a daily basis. In other words, we put our own sinful desires down to serve God and follow His wisdom. I don’t have the video up but should have it here by Saturday. Thanks for your patience and grace. 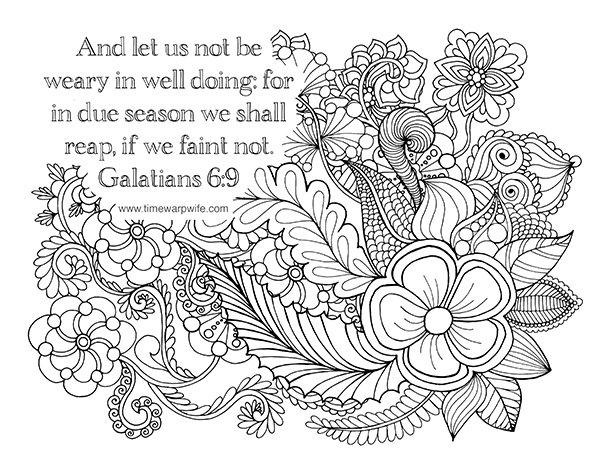 How does one help restore a fallen brother according to Galatians 6:1? What should our attitude be in this? We must be meek. If we have pride, then we aren’t correcting others for the sake of Christ, but rather to puff ourselves up. Therefore, we should examine our lives carefully and prayerfully before we step out to correct others. We have to remember that we are every bit as sinful as the next person and that’s it’s only by the grace of God that we’re forgiven. What does it mean to ‘bear one another’s burdens’? There are a lot of ways that we can bear each other’s burdens. We can listen to each other with compassion and understanding. We can pray for each other. We can lend hand when we see a need. We can support people financially. And if someone is overtaken in a fall we reach out to them with humility and truth. In what way does verses 3-4 relate to Proverbs 16:18? In what way can we avoid this prideful attitude? Pride is more destructive than we realize. In fact, it works against us, as the more self-centered we are, the less effective we are in reaching out to others and living a Christ-centered life. Why is it so important to financially support those in the ministry? Verse 10 tells us to do good to others, especially those who are of the household of faith. If we aren’t supporting our ministers financially, they aren’t able to shepherd the congregation as affectively as they would in full-time ministry. 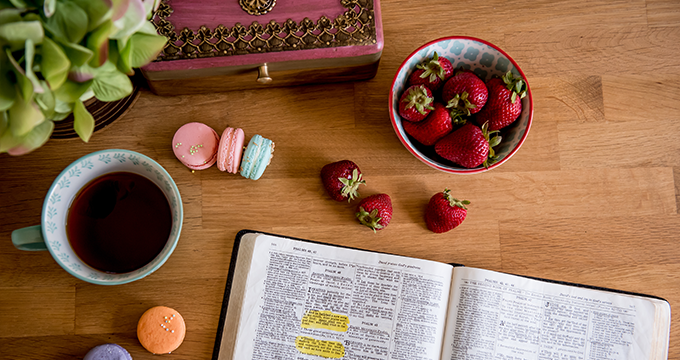 When a pastor is pulled in too many directions, he can’t devote as much time as he otherwise would to God’s word and serving the people under his care. How does Galatians 6:7 show similarities to Numbers 32:23? Name 2 or three individuals in scripture who reaped the results of the sins that they sowed. These two scriptures teach us that we sow what we reap. If we think that we’re hiding sin, we are only fooling ourselves because God sees the inner man. An example of this in scripture can be found in Acts chapter 5. Ananias and his wife Sapphira sold a piece of property. Pretending that they brought all of the money to the church, they actually kept a portion for themselves. Not only did they lie to the apostles, but Peter pointed out that they also lied to God. Confronted by the church, they died within hours of each other. Even once they were confronted by the church, they continued to lie, and the Bible tell us how they fell down and died. Another example is found in the story of Esther. Haman was a man full of pride who set out to destroy Mordecai. Throughout the book of Esther, we read about Haman plotting and planning to do away with the Jews. God turned the tables on Haman. Everything that Haman meant for evil, was used against him. His pride was the very thing that led to his demise, and in fact he hung on the very same gallows he prepared for Mordecai. What does Paul mean by doing good to those who are of the household of faith? How does this coincide with verse 6? Verse 6 tells us that we should be supporting those who teach us. As I pointed out earlier on in this chapter, a church is stronger when the Pastor is freed from outside responsibilities. That’s not always possibly unfortunately, but would be all the more if people took this instruction to heart. What were the REAL motives of the Judaizers, according to Paul? They were motivated by pride. If the Galatian church followed them they would gain recognition and praise. Not for what Christ has done, but for what they had done. In Whom Does Paul only want to boast in? In Jesus. Paul doesn’t care about personal recognition, but rather the recognition of what Christ has done and who He is. Paul isn’t glorying in the cross itself, but life giving force that Jesus became when He was nailed to that cross. What’s interesting to note is that in the last chapter, Paul talked about dying to the flesh. In this chapter he’s talking about dying to the world. He doesn’t serve man. He doesn’t serve to please man. He’s not concerned with popular opinion and is willing to turn his back on anything and everything that stands in the way of his faith. Looking forward with great anticipation to Jesus’ Beauty/Feasts! My passion is studying the Old Testament & Hebrew in order to truly understand the New Testament.